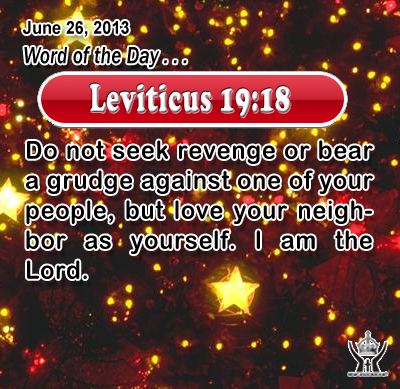 Leviticus 19:18Do not seek revenge or bear a grudge against one of your people, but love your neighbor as yourself. I am the Lord. Heavenly Father, God of love and mercy, please remove from our heart any cynicism or delight in seeing others around us fall. Instead, help us to be a rescuer rather than a neglector. We want your grace to be seen in our friendship network. In Infant Jesus' name we pray. Amen. 15"Beware of false prophets, who come to you in sheep's clothing but inwardly are ravenous wolves. 16 You will know them by their fruits. Are grapes gathered from thorns, or figs from thistles? 17 So, every sound tree bears good fruit, but the bad tree bears evil fruit. 18 A sound tree cannot bear evil fruit, nor can a bad tree bear good fruit. 19 Every tree that does not bear good fruit is cut down and thrown into the fire. 20 Thus you will know them by their fruits. Today’s Gospel we see Jesus connects soundness with good fruit. Something is sound when it is free from defect, crumble, or disease and is healthy. Good fruit is the result of sound living according to ethical truth and upright character. The prophet Isaiah cautioned against the dangers of falsehood: Misery to those who call evil good and good evil, who put darkness for light and light for darkness. The fruits of falsehood produce an simple religion which takes the iron out of religion, the cross out of Christianity, and any teaching which eliminates the hard sayings of Jesus, and which push the judgments of God into the background and makes us think unconscientiously of sin. How do we avoid dishonesty in our personal lives? By being true to God, his word, and his grace. And that takes nature! Those who are true to God know that their power lies not in themselves but in God who supplies what we need. The fruit of a follower is marked by faith, hope and love, justice, carefulness, fortitude and temperance.